Can you sail this baby?’ asks Jacob, peering at me over lowered sunglasses. 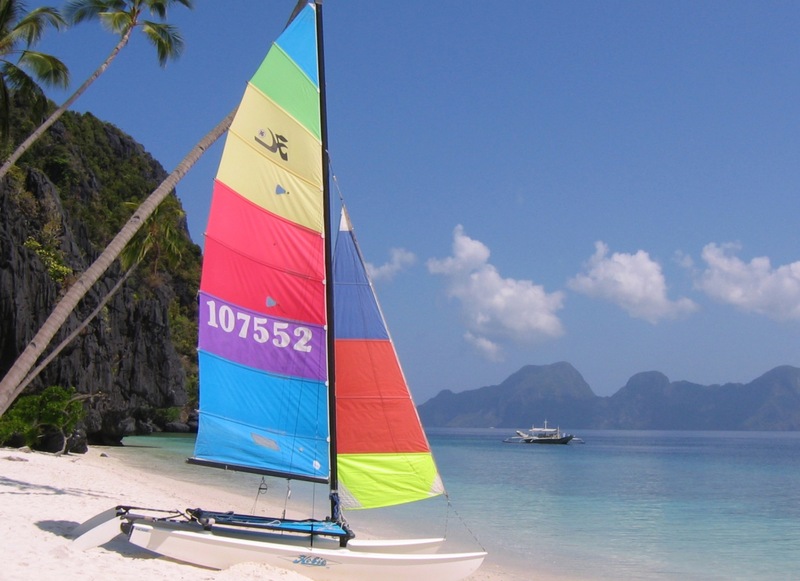 I wave the question aside and help haul the Hobie cat down to the crystal topaz waters of the bay. ‘Can I sail?’ What a stupid thing to ask a guest. Am I not wearing a wide-brimmed sailing hat with chin strap? Has he not seen the diver’s watch on my wrist, waterproof to a 1,000 feet? He won’t give up. ”Sailed a Hobie before, man? Maybe you needing a little teachin’?’ Oh god, this is getting tedious. It’s just a plastic holiday boat … a toy sail, one rope and a rudder a three year old could operate blindfolded. ‘Thanks but I’ll be just fine.’ I clamber on board and Jacob pushes me out into the gentle breeze, yellng something about cleats. Rudder down, main sheet in, a sailor’s grin on my face and I’m away. I cross the mile-wide bay, tacking back and forth with the easy confidence of a pro at work. I spot a man in another Hobie a hundred yards away, running parallel and catching me fast. I haul the main sheet in a tight as I can and lock it in a cleat. The rainbow sail fills and we surge ahead, spume cascading over the bows, soaking me. We are flying! One moment I’m hooting with glee, the next moment the cat has inexplicably reared up at sixty degrees and I’m staring down at it. I crash down onto the now lifeless sail that floats like a convenient safety net on the surface. I swing the boat around mast to wind and try to right the thing by pulling on the pontoon but can’t generate the leverage. Must be something wrong with the boat. The wind has really got up and we drift rapidly towards the wild opposite shore. Rocks are struck. Egos are dented. I gash a finger and blood is spilt. A rescue launch appears from nowhere. It’s Jacob. ‘You alright man, you be needing a little teachin’? The Hobie is now impaled on the rocks and can’t be recovered so Jacob ferries me back to the resort while I try to wipe crimson stains from his white leather seats. It’s a bit windy this afternoon. Maybe I’ll try again tomorrow. Or the day after. Perhaps they’ll give me a better boat.